This past week was a big gathering of convention goers to the ever popular Comic Con, where all the comic book geeks, cosplay dressers, and weird sci-fi fantasy lovers convene in one big spot to express their love for all that is great with their world. For me, I'm just waiting for the brand new movie or TV show trailers to pop up online after their conference. No lie. I was careful to avoid all of them, so I made a rash decision in a quick pilgrimage down to SD as fast as I can as I know traffic around convention center will be rough. One of my pit stop in San Diego was make a bee line to Little Italy where all the hip dessert places or well known eateries are at (see my Extraordinary Desserts review). Alas, I found no quick parking and needed to park near the train station parking lot. 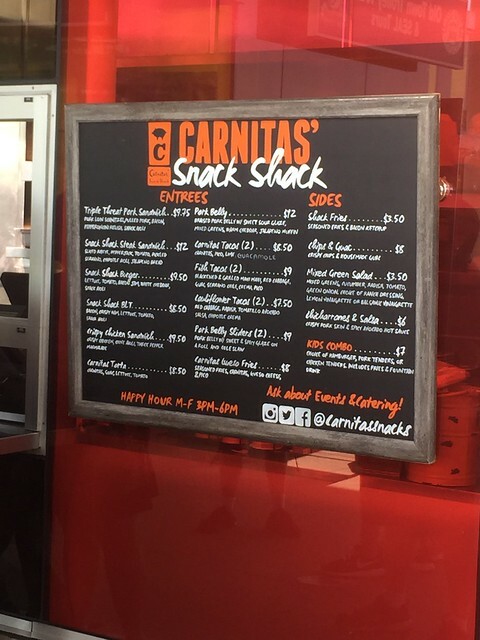 Using my little quick map guide, I totally forgot that a brand new(ish) Carnitas' Snack Shack opened up a few block down near Little Italy joints I wanted to visit. Probably the best decision I had made in what was a regrettable trip down so far that day. Personally, I didn't knew much about this little snack shop, other than a search of what's the best burger or hottest place in San Diego. This place always seemed to pop up on the search engine. Kudos to the web guy that is able to figure out the dynamics of SEO. To call it a snack shack is also somewhat misguided as well on my part because I found it to be a full course meals on hand as a standalone restaurant. In what disguised as a fast food take out place on a food stand near embacardero region of the city was a place-to-order restaurant with a full service bar attached to this quasi stand. It's a pretty much an order to go, where there are many benches and tables set up in a quad area for you to sit and dine. 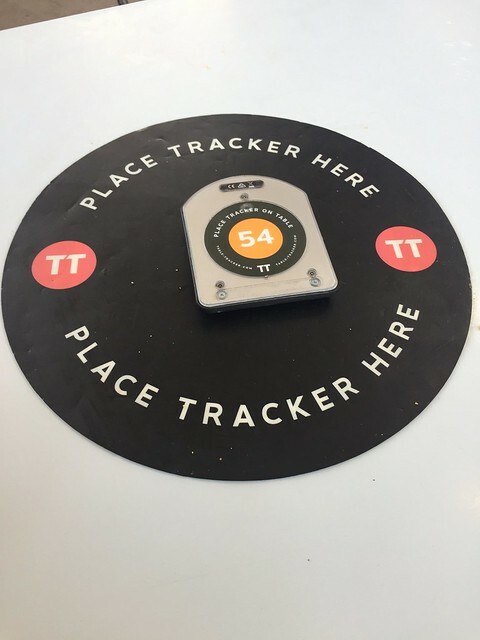 They pretty much handed a tracking buzzer after you ordered where the tracker is for them to bring out the tray to you if you wish to dine in near the stand (pretty sure it's only close proximity). It was after I sit down at one of the communal table, I realized they are also a full service restaurant with menu to order in as well. Well, I'll be darn and learned that for next time. Well, what's so special about the place that makes me wanting to come here out of the blue moon? Apparently this place was mentioned by USA Today as having one of the best 10 burgers in the USA. Blow me down! This got my attention. 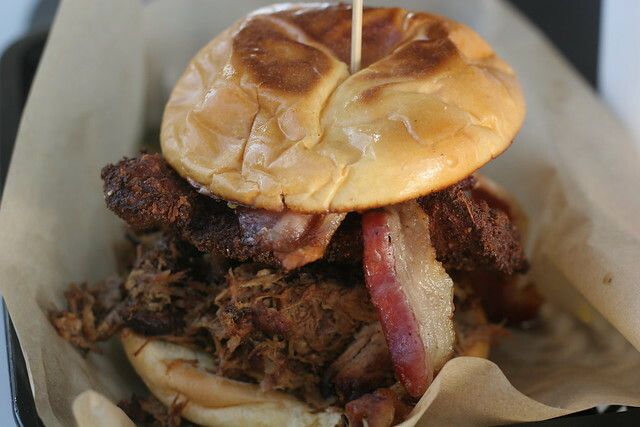 The Triple Threat burger with all its porky glory consisted of Pulled Pork, Bacon, and Pork Loin Schnitzel to confound anyone's imagination on how to proceed this eat this ginormous monstrosity. To put it mildly, it was insane to think you can gobble this down without the need of a drink, but I devoured this within a short amount of time as it was too good to stop and contemplate anything else. As I mentioned earlier, it's not just a fast food, but they also served some fine dishes with their careful salads to unique starters. 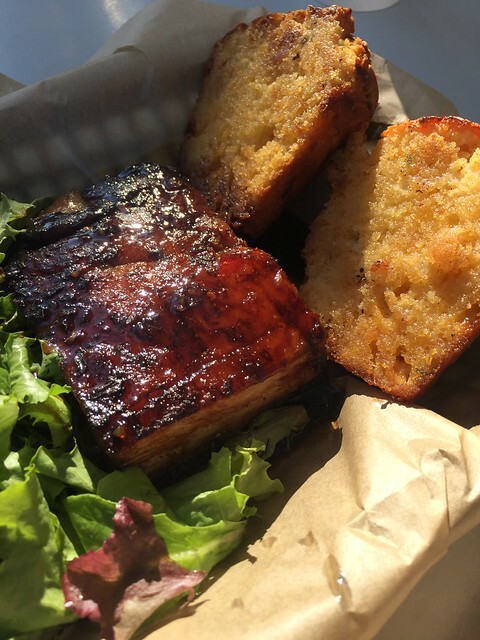 One of the more popular requested order was the pork belly that was probably the best companion to the Triple Threat burger. It glistened on the hot sunlight, but melt tenderly right in your mouth when you tasted it. With some homemade cornbread and a side salad, this would have been perfect as a dish by itself. This establishment had came a long way and blew up in what I remembered from earlier this decade. I was quite impressed by my visit and wanted to try other pork oriented dishes that they may have in stock. I have heard they have other creations as well such as their beet dish, but has since taken out of circulation in the menu. Pretty much have to look out for the menu for any new additions in the future. In what was a dreadful day getting stuck in traffic for me coming down from LA area. I probably can go to Las Vegas for the same amount of time to go to San Diego on that fateful afternoon. If there's a redeeming value, this place was it. Glad that I get to finally get my hands on that triple threat.